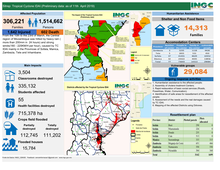 11 April 2019, Washington – Education Cannot Wait, the United Kingdom’s Department of International Development (DFID) and Dubai Cares announced today new commitments of up to US$14 million in funds to support educational responses in the wake of the devastation from Cyclone Idai, which caused widespread destruction and displaced hundreds of thousands of people in Malawi, Mozambique and Zimbabwe. 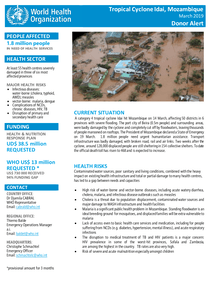 Following the severe floods in Mozambique, Malawi and Zimbabwe there has been hunger, cholera and malaria. 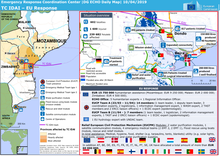 Cyclone Idai caused devastation across Mozambique, Malawi and Zimbabwe last month, killing at least 750 people and leaving around 3 million in desperate need of help. 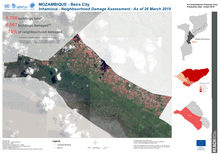 In Mozambique, the death toll stands at 602. 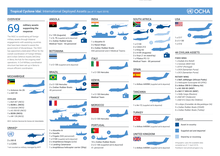 As of 10 April, UN OCHA confirms 3 577 cases of cholera and 7 124 of malaria. At least 745 609 people have been vaccinated, 389 632 in Beira, 44 544 in Buzi, 149 416 in Dondo and 162 017 in Nhamatanda. More than 756 200 people have received food assistance. In Zimbabwe, 299 people are dead, more than 186 injured and 270 000 people have been affected. At least 30 000 people have received food assistance and 43 000 access to clean water. 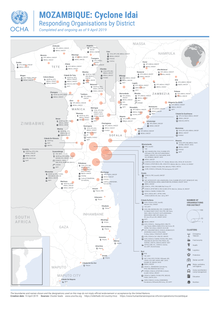 In Malawi, 59 people are dead, 672 injured and 87 000 displaced in emergency centres. 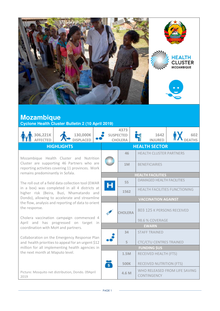 Mozambique Health Cluster and Nutrition Cluster are supporting 46 Partners who are reporting activities covering 11 provinces. Work remains predominantly in Sofala. The roll out of a field data collection tool (EWAR in a box) was completed in all 4 districts at higher risk (Beira, Buzi, Nhamatando and Dondo), allowing to accelerate and streamline the flow, analysis and reporting of data to orient the response. Cholera vaccination campaign commenced 4 April and has progressed on target in coordination with MoH and partners. 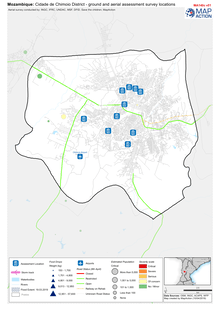 The Humanitarian Country Team has activated nine clusters in support of the Government-led response. WHO is the Health Cluster lead in support of the Ministry of Health. 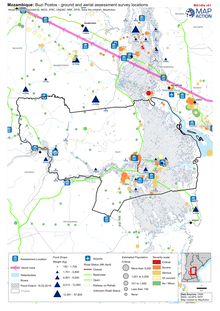 When Tropical Cyclone Idai hit Mozambique, efforts to deliver humanitarian assistance to those in need were challenged by the storm’s massive impact on logistics infrastructure. 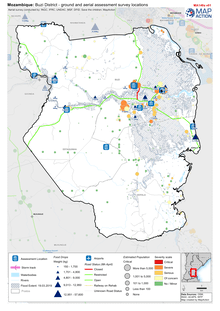 As the storm passed, continuous flooding only created further complications for responders on the ground, with normal transport routes impassable and affected communities cut off by road transport. 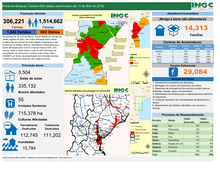 There was a critical need for information on the hardest hit areas, populations impacted, and how to ensure the quick delivery of relief assistance. 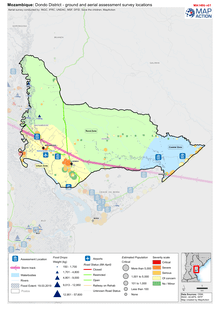 This Situation Report is produced by OCHA Regional Office for Southern and Eastern Africa in collaboration with humanitarian partners. 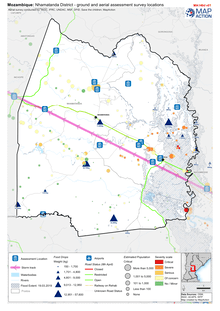 The Situation Report builds on Flash Updates #1 through #15 and provides detailed information on the situation and response by sector. The next report will be issued as of 10 April 2019. As of 9 April, 495 new cholera cases were reported, bringing the total reported cases to date to 4,072, according to the Ministry of Health. Of these, 3,989 cases have been treated and discharged. 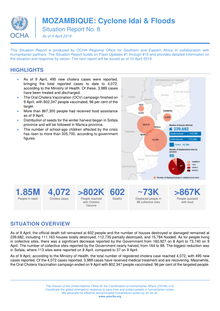 10 April 2019, Maputo - The Ministry of Health in Mozambique has concluded a successful six-day emergency cholera vaccination campaign that reached more than 800,000 people in four districts affected by Cyclone Idai. The campaign was supported by around 1,200 community volunteers and partners including the World Health Organization (WHO), UNICEF, Médecins Sans Frontières (MSF), International Federation of the Red Cross and Red Crescent Societies (IFRC) and Save the Children. Zimbabwe: EUR 4 500 000). ECHO Office: 5 humanitarian experts + 1 Regional Information Officer. EUCP Team A (23/03 – 11/04): 14 members (1 team leader, 1 deputy team leader, 3 coordination experts, 2 logisticians, 1 information management expert, 1 WASH expert, 2 TAST members and 2 ERCC liaison officers) + 1 ECDC expert (epidemiologist). (10 April 2019) Celebrating 10 years of building evidence for action on cash transfers in Africa, the Transfer Project’s latest multi-stakeholder workshop in Arusha, Tanzania recently gathered social protection experts from 20 African countries. Attended by government representatives, NGOs, academics, and donors, the workshop facilitated cross-country learning, dialogue and debate to inform the development of social protection policies.